I have been following some of your blogs and will devote one recommendation per month (or less) to share 10 posts that I have read and loved. I hope other bloggers will enjoy reading them too. The above badge is my creation and if your blog is recommended please feel free to pingback or reblog this post. You may right click on my MUST READ badge and add it to your post and please link back the idea to this particular post. This is just my raw idea as a way of saying THANK YOU for sharing your posts. Here are my first 10 recommended posts that roll of this raw idea (in no particular order). Please place your mouse on the nomination and click to get you there. 1. We will start off learning how to make spicy indian potato balls. 2. Let’s check out Leigh Kendall’s headspace perspective of Beautifu Aotearoa, a country where I now live. 3. Fancy eating scorpions? Let’s check out sandstone and amber’s bizarre foods in Beijing. 4. If you do travel and go out and about, let’s go and check on some Australia slang. 6. Want to try making some sweet potato gnocchi with mushroom sauce? Prettyeasylife said it is not as difficult as it seems. 7. Verawrites is asking ‘Carrots, eggs and coffee – which one are you? 8. Want to know why some of us wear shoes at home? Mabel Kwong has the answer. 9. Were you ever in a long-distance relationship? Ping, your sweetheart has signed in so beautifully written by Zen Scribbles. 10. Finally perhaps you may want to try making Flourless Chocolate cake? Expat Alien shares with us a recipe from Whole foods market. Wow, that was not such an easy task after all ! Took me longer than I thought. Those above recommendations are from the earlier blogs I followed so if you know I am your follower and do not yet see your post in the recommendations please watch out this space coming up again soon. 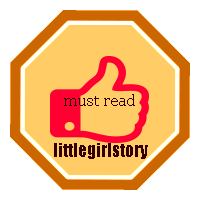 Littlegirlstory reserves the right of this idea and no part or whole of the badge may be copied or altered. Only the nominees listed here has the exclusive right to use this badge if they chose to for their nominated post. This entry was posted in littlegirlstory MUST READ posts and tagged littlegirlstory must read posts, postaday by Little Borneo Girl. Bookmark the permalink. Hahaha – you are so rumbled – foodie you are indeed 🙂 (and now I shall diligently go read). Haha. No-one should be allowed near my baking until I’ve had at least 6 months practice. It’s been over a decade….! In all honesty, I didn’t notice that. But it blends well with your blog! The red colour gives it a very warm touch. Great blog, and thank you for including me on it! Hey I’m new to the site! If you could check out my blog that would be great, thanks a ton. Hi Julia, I have visited your new blog. Congrats for joining the bloggers community. I believe your blog is very new and I tried to post a comment there but could not find any buttons so perhaps you may want to check the layout and theme of your blog. Overall, my two pence worth of thoughts on the post contents, you may wish to break down your post into paragraphs as it will be easier to read . If the paragraph is too long, you may lost your readers halfway.